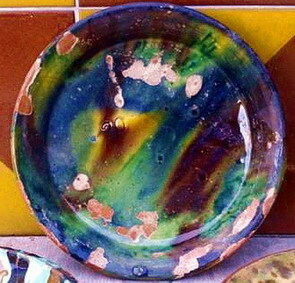 A stunning rarely found Provencal Plate at 10 inches in jaspe that was used as a 'Plat Equipage' (Daily use plate). From a very rare collection that J&V managed to procure. Everything about this plate is J&V all the way. The classic early 19thC design and glaze patterns and colors. Just normal wear and tear from utensil usage of the generations! It makes a great French Country statement in the kitchen and works beautifully in a home of all styles, formal or rustic country. You won't find another like this one at this size or true age.